A continuing problem we see with A3 reports is the mistaken assumption that there is only one way to write the report or one corporate template that practicioners must use. There is always value in standardization however enforcing one template will cause as many problems as it will solve. 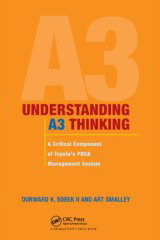 We titled our book "A3 Thinking" for a reason. The authors of the reports have to think and figure out what works best for their respective situation. No two reports will ever look exactly the same. Instead of enforcing a certain template we provided several different examples and loosely referred to them as problem solving reports, implementation or status review reports, or proposal reports. Each of these has a different purpose and hence framing mechanism. For interested parties here are some of the examples we included in the book. There is no reason for yours to mimic these in terms of the exact headings or contents. However all good A3's adhere to the seven elements we address in the book and other criteria. Please visit the A3 Thinking Blog for more discussion on these elements and criteria. Here are also some links to examples of different formats. For those interested in purchasing a copy of the book please visit the links below.